If you execute or test an Expert Advisor on a laptop, personal computer or a VPS, you may face the situation when Internet connection is lost and the EA stops. 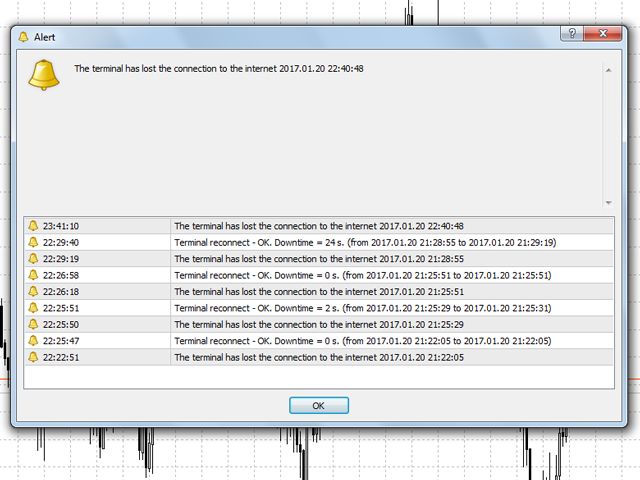 Of course, this utility (Disconnect Alerts) will not help you restore the Internet connection, but it will gather the information and will send an alert to you about when and how long your terminal was without access to the Internet and did not actually work. After receiving such a notification, you can check your trades or think about the ways to prevent such situations. The tool produces a sound alert and displays a warning message on the screen, as well as send Push notifications to a mobile terminal. If you want to enable push notifications, set 'Send Notification' = true. You should also properly configure your MetaQuotes ID in the terminal settings (how to do it). CheckTime - time in seconds for the script o check Internet connection. 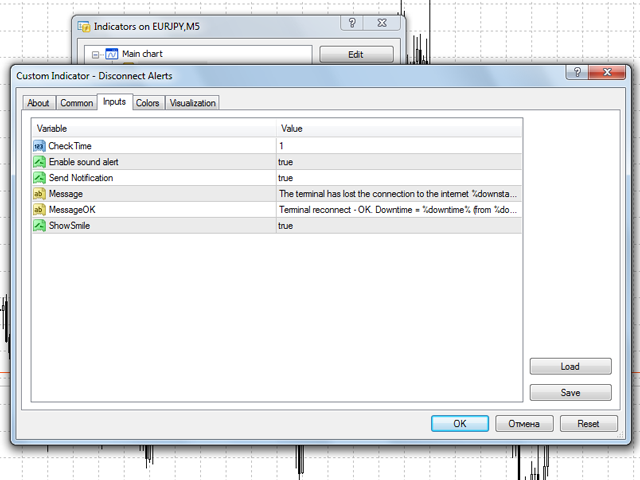 Alerts - allow sound alerts and message display on the screen. Send Notification - allow sending Push notifications to your mobile terminal. Message - the text of the message when the Internet connection is lost. 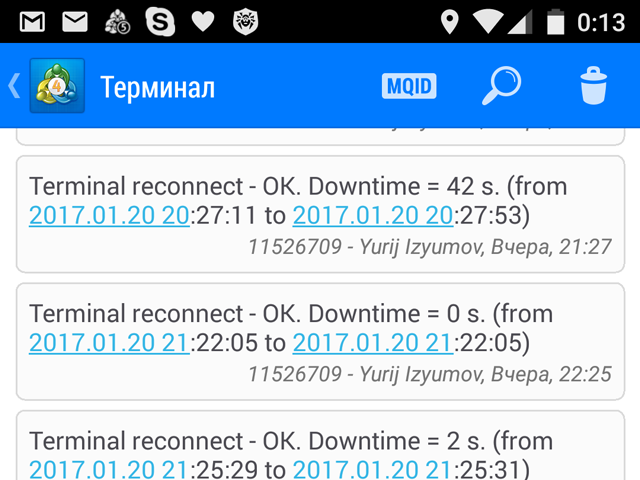 MessageOK - the text of the message when the Internet connection is restored. ShowSmile - show/hide a color indicator of connection state. %downtime% - the time during which the terminal was disconnected (format XXh.XXm.XXs. - hours, minutes, seconds). %downend% - time when connection was restored. P.S. You should understand that once the Internet connection is lost, the terminal completely stops and cannot send a Push notification, but it will send a push with all the information as soon as the Internet is restored.